I’m sure that it will come as no surprise to you that I collect egg baskets. I like how they cross that line from utilitarian to decorative. I like how they whisper of past farms and animals. 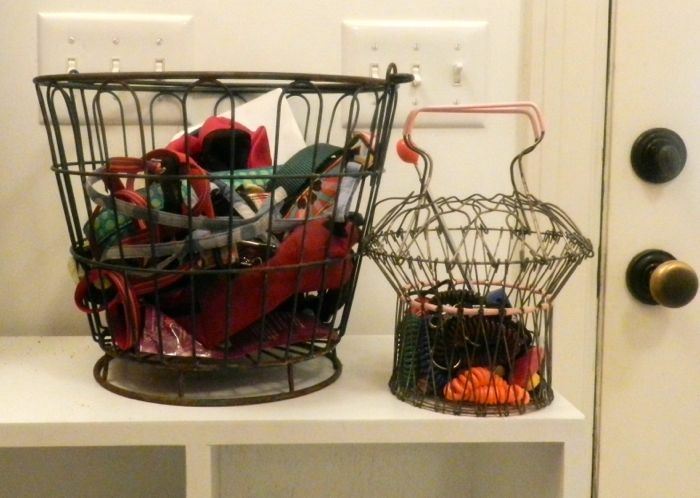 I don’t like a lot of clutter, or masses of objects, but that’s not a problem when it comes to collecting egg baskets because they are ever so useful. 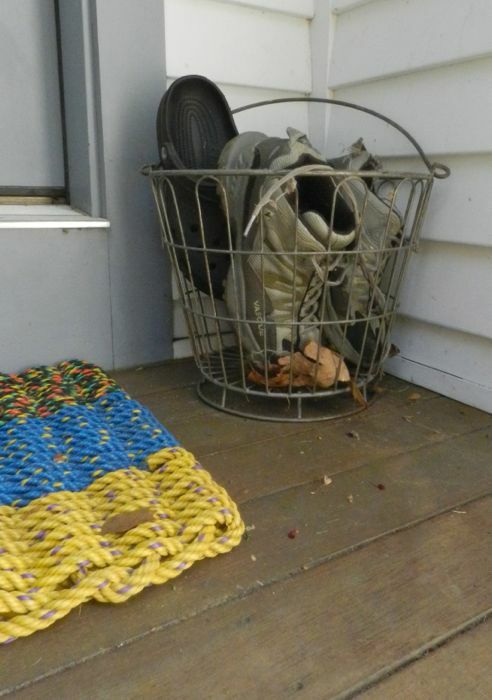 I store my outside boots and crocs in a basket by the porch door. 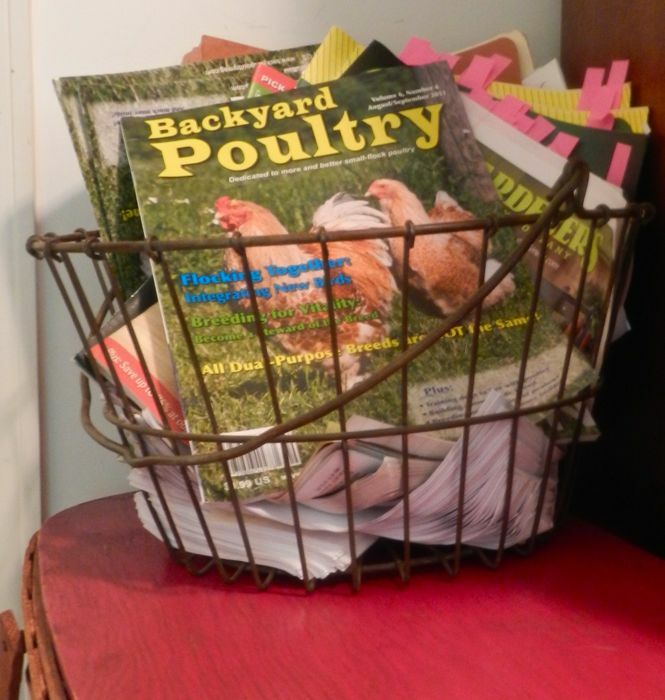 Magazines and garden catalogs are corralled in my office in this basket. 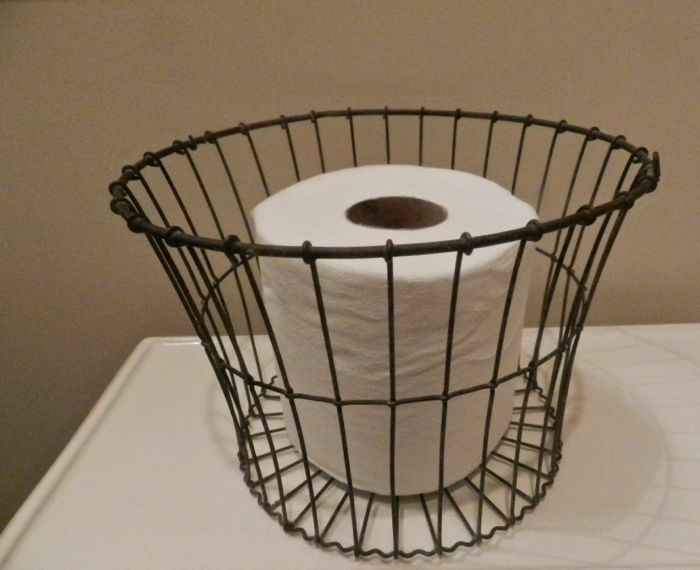 There’s even a basket put to work in the bathroom. This one is exactly the right size for spare toilet paper. 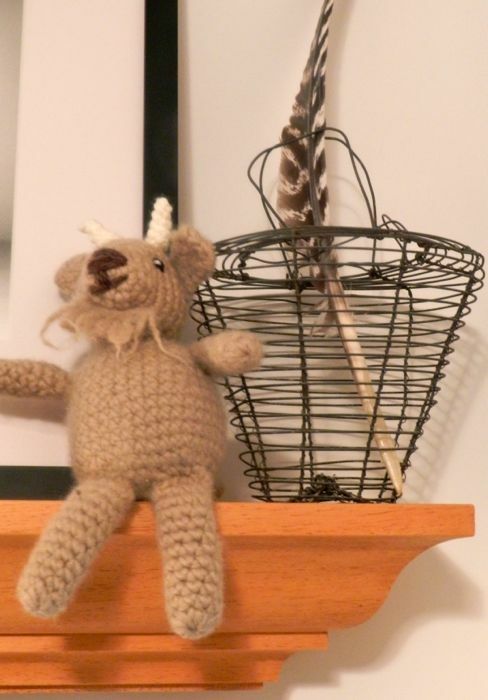 There’s room for two purely decorative egg baskets on the stair landing. 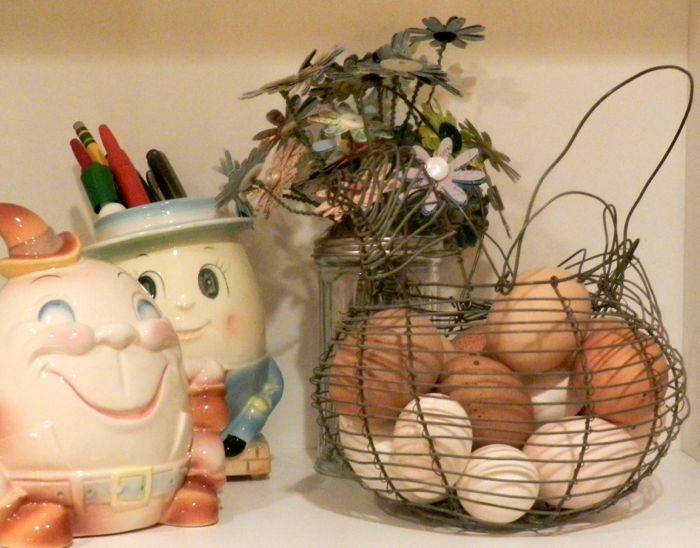 A wire basket shaped like a hen holds blown out eggs on a shelf near my craft table. 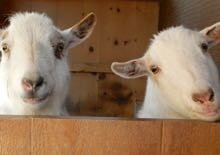 But, my favorite basket of all is the one that I carry out to the barn to collect eggs. It has little feet so that if I set it down a bit too hard the eggs won’t break. It has a curved-in top so that if I tip the basket the eggs stay in. It isn’t too big or too small for the seven to nine eggs that I collect daily from my hens. It’s old and lopsided. Perfect, isn’t it? What do you collect your eggs in? I love all your egg baskets. You have given them a useful purpose in our very modern life. T-shirt, or what ever container I grab. 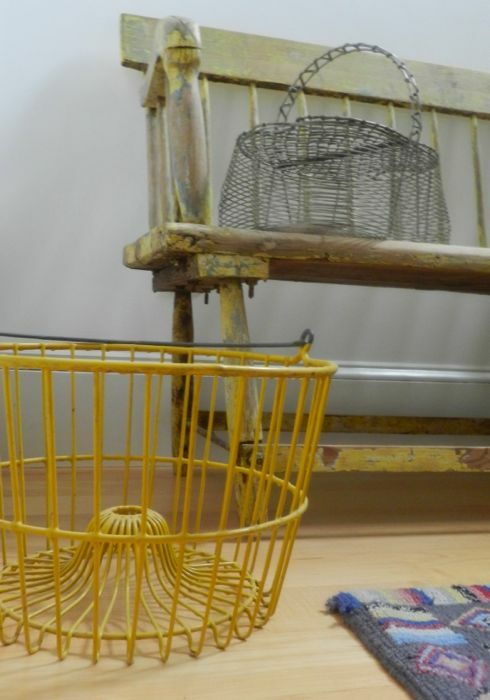 wire chicken basket… a thrifted find that thrilled me. Egg baskets, in So Cal, are a rare-rare find. big ones, and each so handy! Petaluma, and noCal were centers of chicken ranching. I’m surprised that you can’t find egg baskets even in Southern Cal. I’ll be out in LA in November. I’ll have to see what I can find! I only collect 3-4 eggs each day so in the winter I just pop them into my jacket pockets. Of course, once in a while I forget an egg in my pocket. I shudder to think if I should forget the last winter egg of the season and what would happen in the coat closet over the summer! Your egg baskets are wonderful. As are your Humpty Dumpties. 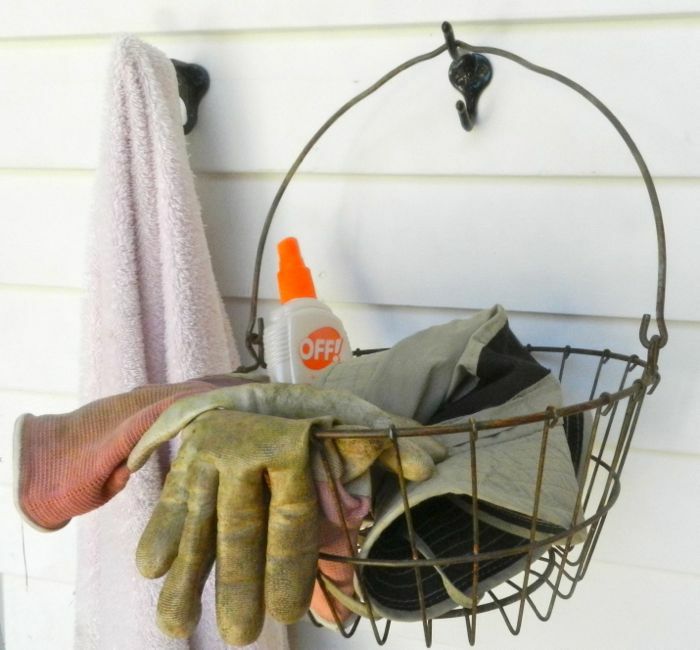 Steve puts them in his pockets in the winter, too, and yes, he has forgotten to empty them out. So far, no broken eggs, but it’s just a matter of time before that happens! 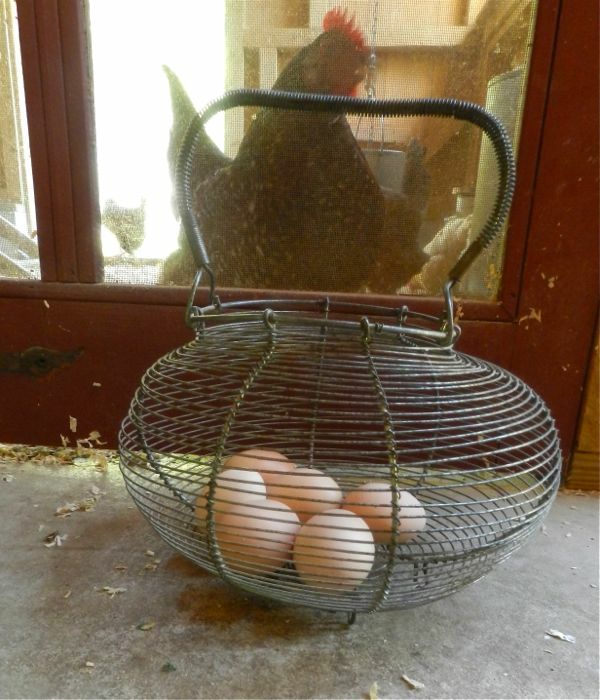 I have been looking for a Hen shaped egg basket for ages!!! Love it! Our girls are still too young for laying yet, but after seeing all your awesome baskets, I will be on the look out during our sunday morning yard sale-ing! Watch out, once you start looking you’ll find plenty! Aha, Terry, now I see what you mean when you said you were an inveterate collector. But what a fantastic way both to collect and to enjoy. Much better than shoving them in boxes under the bed. Love chickens? Love vintage? Combine the two and that’s what you’ll find here. You might also find quirky, crafty, retro and recipes. And maybe something fun with a rabbit on it. Or a goat. It’s that sort of blog. I’ve written about most of the issues that arise in backyard flocks. I’ve written FAQs to answer the most commonly asked questions. If the answer you seek isn’t in a FAQ, there’s a wealth of useful information on my website archives, which is easily searchable – simply type the topic into the box.